Going home day. The day we had been looking forward to for a while now, even before Baby decided to come early. We had planned to leave before the customary 48 hours, but since she came early, we conceded to the idea that we should stay and make sure things were all right. On that day, it suddenly occurred to me that we were taking her home. All by ourselves. And the challenge began from the very first moment - the moment we decided to change her into her "going-home" outfit. Too big, of course. All her clothes are too big. Here's how to torture a baby. It works with good babies, too. Babies who are usually calm and peaceful, full of sighs and squeaks, babies who become undone with the prospect of putting on different clothes. Anise gave Baby this outfit. Anise said the thing to do is take pictures of Baby in the various outfits people give as gifts, then send them copies of the pictures. So, here you go Anise. I'll be giving more when she grows into this outfit. It might be awhile. Here's proof that she did indeed go home in this outfit. She screamed and screamed. I was beginning to wonder if the nearby Mississippi River would carry her screams all the way to St. Paul. I'm certain everyone could hear her down the hall and maybe the floors right above and below. So much noise from such a little peanut. 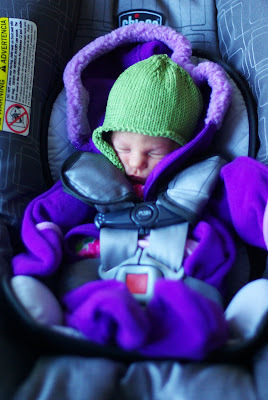 Of course, I had to get pictures of Baby in her new hat, the first hat I ever knitted for her. And, then, of course, this is Minnesota, so she had to be bundled up. Suddenly, I became the nervous mama reading the car set manual that warned against bulky clothes. She was swimming in her winter, newborn coat. That was just the beginning. We had to figure out how to get all our gear down to the main entrance, including various breast pump gadgets, a vase with two bouquets of flowers (thanks grandmas! We were very grateful to all those kind souls who had flowers sent to our home), a bag of fruit (? ), and baby in car seat. The great thing about going home was that there were no more than a few squeaks out of Baby. Apparently she liked the Jeep ride, bumpy roads and all. But, man oh man, driving a vehicle becomes a whole new experience in responsibility when you've got a Baby on board. I'm going to have to rethink this blog, again. I have to rethink my photo project as the a year of Lotus doesn't matter so much to me anymore as much as a year of Baby does. I also have to think about how I want to refer to our new little family. Lani, Kat, and even you, Anise (and anyone else out there how may be blogging and by chance reading this) - how much did you all think about whether to use your names. Does it ever feel too revealing? I would appreciate anything you may have to say about this. I can't believe she's here! I'm so excited. When I first came to your page the other day, I let out a loud "What?!?!!!! I think it scared my husband. I'm just so excited to see pictures of her. She's absolutely beautiful. I look forward to the blog updates...whatever route you take. As for revealing names, I guess I never gave it much thought but you have to stay within your comfort zone. I was comfortable sharing my first name but I also started my blog so family and friends could keep up with our travels. They, of course, knew us already. Sometimes, however, it does interfere with how much information/feelings I want to share on my blog. I don't want to get too personal since my identity is known. (i.e.,...Someday I may be searching for a job and a prospective employer may come across my blog.) Does that at all make sense? Again, do what you feel comfortable with. My parents said I loved the car as a baby & sometimes driving me around in ti was the only way to get me to stop crying. As for names. I used Matt & my first name. I don't think its a big deal. For kids like my nephews, I also use their first names. I have a lot of friends though who mainly use just the first initial online, saying something like Miss A. Another online friend calls her daughters Thing 1 & Thing 2. But other than names I don't delve too deeply into personal things on my blogs. There are just some things I don't want to share with the world. I giggled the whole way through this and was full of memories about my son during his first few days. Such precious memories. I'm so glad that you are capturing them this way. Our baby book got ruined in a flood years ago now...I lost all these precious pictures and moments. I'm so glad yours are safe and sound here. The only strap he didn't scream about was the one I finally got him after I lost him in the Philadelphia mall three times because he was playing hide and seek with me on a Saturday afternoon and I decided that panic and lack of safety and the fact that it wasn't good for his shoulder to be up holding hands all the time required one of those wrist leashes. Lots of people stopped me and told me I was being abusive. I had a contented kid though, so I knew differently. It was the only strap he ever liked. LOL! I think you should pick some silly sweet name for all three of you and go for it. It will make you feel better even if you decide later its no security issue to share here. Thanks Ladies! I had planned on using our names as I don't see much of a security risk. But then all of a sudden, I got freaked out. I don't know why and I guess it could just be all the change in hormones surging through my body. Greenwoman, you know I've been going through this back and forth dealio about this decision for a while now. Thanks for your continued support! Everything is different right now and I just need to give myself time to adjust, I think. You all rock! And I want to honor the example that you all set for me! She is so beautiful and it brought me so much joy to see her in that outfit. I loved your story about the adventure home. Now you understand those "Baby on board" signs. However, I would never have one. Go wherever your blog takes you, its your blog. Just keep blogging because I love your pictures and stories.